Imagine relaxing after a long day in a steaming bath of hot chocolate. The warmth soothing tired muscles while rich chocolately aromas swirl through the air and melted cocoa butter moisturises your skin. The best part of all? It could actually good for you! Cocoa powder contains high levels of caffeine that when used externally helps to firm the skin and reduce puffiness. Cocoa butter keeps your skin supple with its creamy oil but it’s also rich in anti-oxidants. These compounds are said to fight free radicals so your hot chocolate bath might just help your skin stay young. 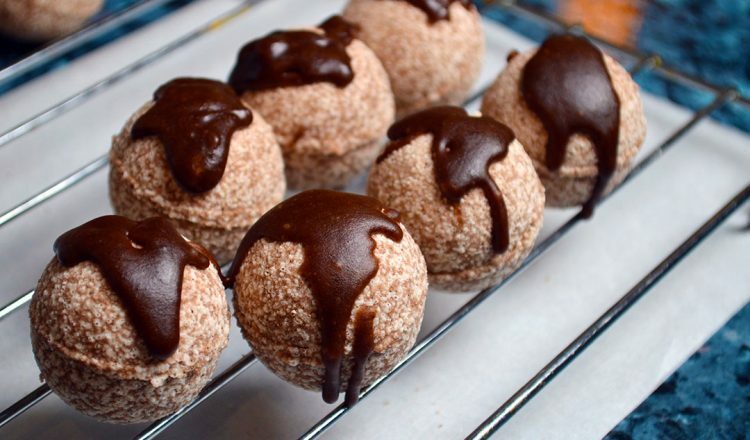 Did I also mention that these nearly edible balls of cocoa deliciousness are calorie free? 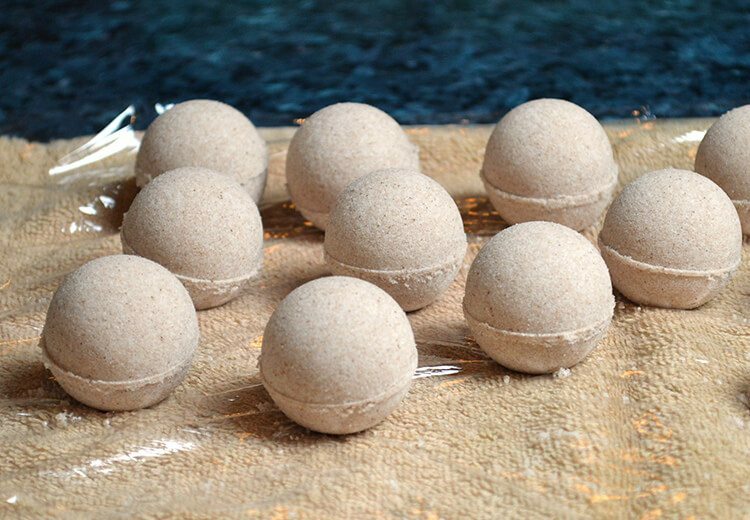 Making these mini bath bombs is fairly straightforward but there is a waiting period of 24 hours between the two major steps. 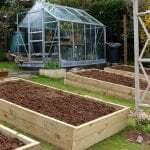 Considering that, this project might be ideal for a weekend and would be a fun activity to make with children. 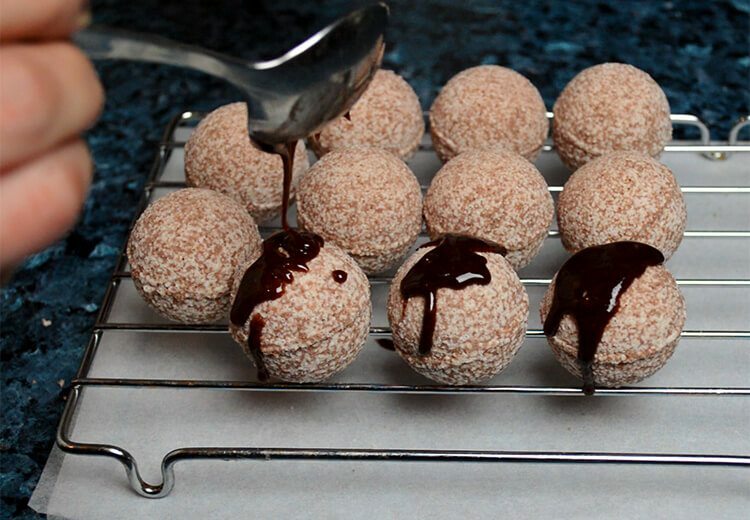 The main ingredients are all natural and food-grade and the process could be compared to making a dessert or candy – though much easier. Placed into a glass container and decorated with a ribbon and handwritten label these little chocolately fizzies also make excellent gifts. The cost of the ingredients is low so you could make loads of them for both friends and the kids in the family. 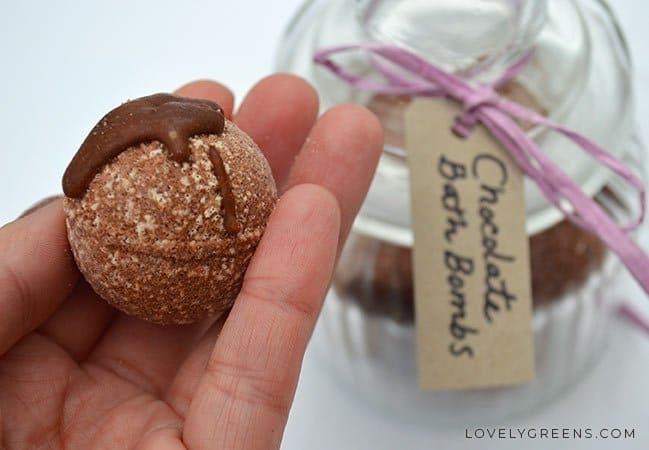 Though little ones probably won’t be interested in the beneficial properties of cocoa, they will absolutely love the chocolate and natural fizz that makes these handmade bath bombs both aromatic and fun! 1/4oz / 8ml Chocolate Fragrance Oil or Cacao (Chocolate) Essential Oil. The fragrance oil is less expensive but is a perfume. The essential oil is all natural. 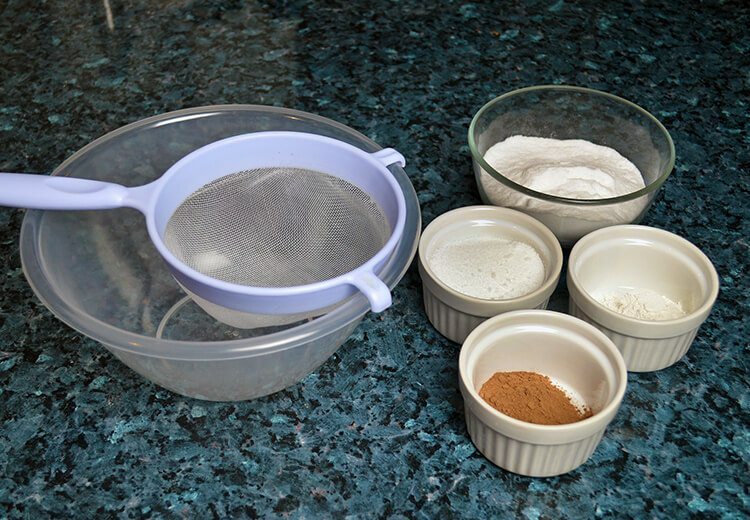 1/8 cup / 27 g Raw Cocoa Butter – the amount in this link is enough for eight batches. Clear Fillable Plastic Ball Craft Ornaments. These are your molds. 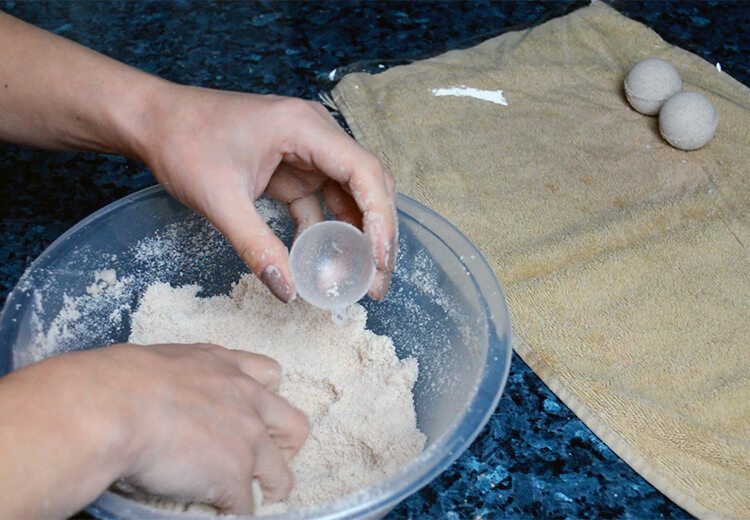 Sift the dry ingredients for the bath bombs into a bowl. 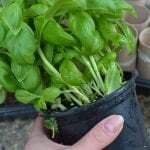 Use a spoon or your hand to mix them thoroughly then add the fragrance oil or essential oil and keep blending until the liquid is dispersed. Now begin spraying with the witch hazel. Spray 2-3 squirts with a fine mist sprayer then mix it into the dry ingredients with your hand. Repeat this process until the mixture begins to hold shape when you take up a handful and squeeze it in your hand. You should be reminded of the consistency of the damp sand you’d use to build a sand castle and it should take no more than 18-20 squirts. Scoop enough of the mix into half of the 2-piece ornament you’re using as a mold. 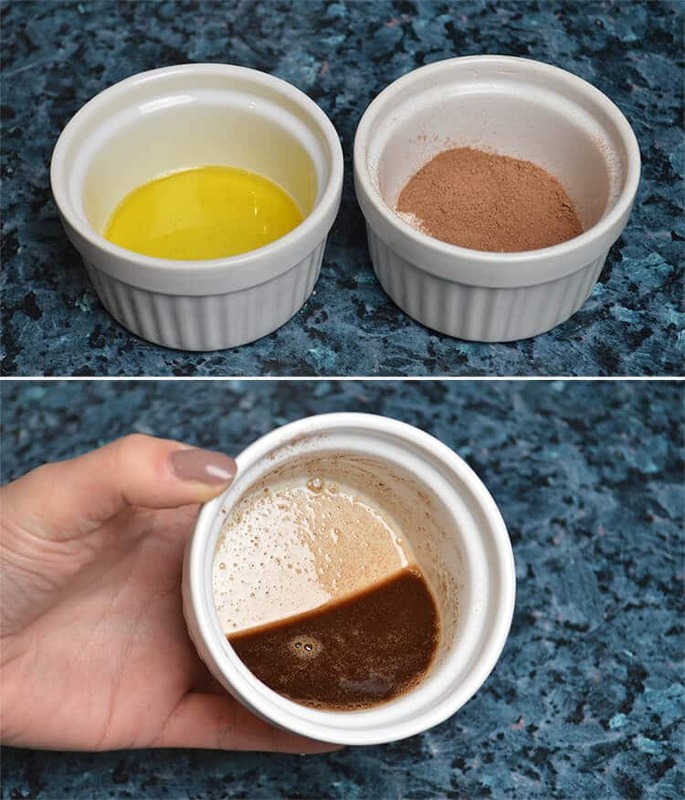 Using your fingers, compact it into the cavity then sprinkle some loose mix on top. Repeat this step with the second part of the ornament and then press the two pieces together firmly. Leave for a few seconds then peel one side off. Holding the bath bomb by the remaining mold piece, gently plop it out and onto a bath towel that’s been covered with cellophane. This helps to stop the round bath bomb from developing a flat spot – it will have this spot if you put your damp bath bomb on a hard surface. Use all of the bath bomb mix to make your fizzies and then leave them to dry for 24 hours. With the bath bombs hardened and smelling LOVELY it’s now time to make the chocolate sauce. I need to add that this step is entirely optional and not necessary for your bath bombs to fizz away. What it does add though is rich cocoa butter that melts on contact with hot bath water and makes your bath extra luxurious. First, melt the cocoa butter. You can do this in the microwave by turning it on for 30 seconds at a time and then stirring. Alternatively, heat the oil in a double boiler until just melted. Next, stir in the cocoa powder. The mixture will be very runny at this point so you’ll now need to carefully stir it and watch for the consistency to become a bit thicker and more like chocolate syrup. If you leave it for too long though the oil will solidify again. If this happens, re-melt it and start again. When the right thickness is reached it should have the consistency of a thin custard. 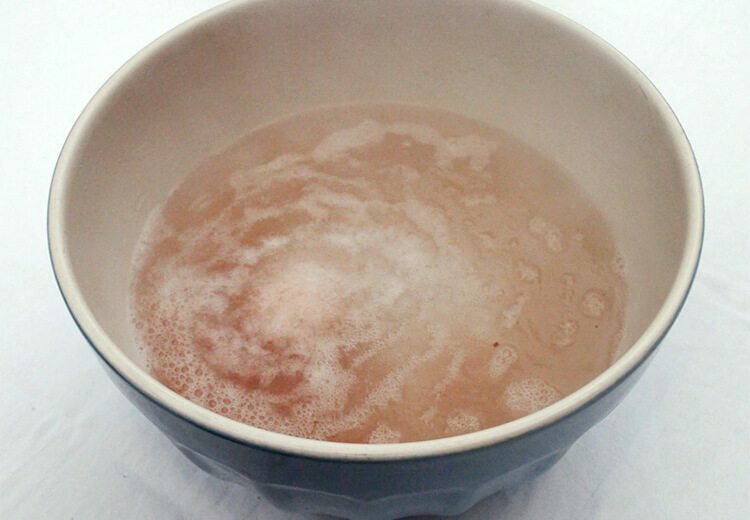 Pour this ‘sauce over your bath bombs which you’ve placed on a wire rack over grease-proof paper. It will harden within minutes but it’s best to leave the bombs for at least an hour so that the sauce effect is not damaged. These bath bombs should be stored in a closed container or they could attract moisture. The only moisture you really want them to interact with is the water in your bath, otherwise they may degrade and fall apart. 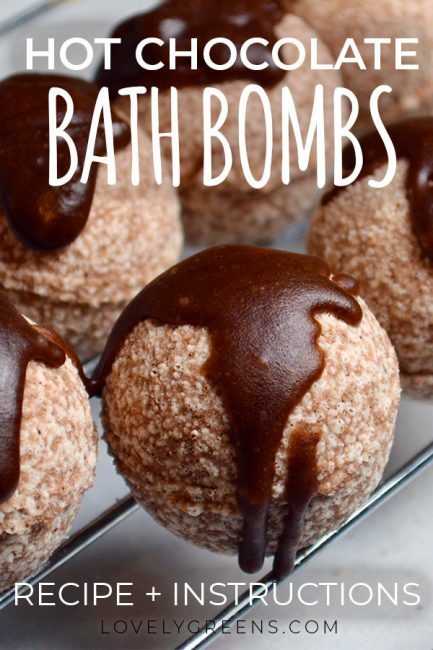 When you’re ready to use them, pop one or two into your bath water and watch as it fizzes and releases rich chocolate scent. The water will turn a light tan to deep cocoa colour depending on how many bombs you use and how large your bath is. This is the cocoa and will be great for your skin! If there’s any residue left in the tub after you let the water out, simply rinse it out with water. These look divine. Can’t wait to make them. Thank you. Cocoa absolute (chocolate essential oil) is a bit pricey, and there are great differences in prices from various suppliers. But search well and you can find some good deals. “Alternatively, heat the oil in a double boiler until just melted.” I’m confused. What oil? 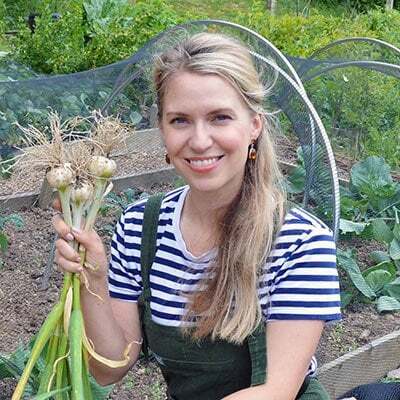 The essential or fragrance oil? I don’t see any other oil listed in the ingredients. Cacao (Chocolate) Essential Oil DOES NOT EXIST. It is always a fragrance oil (not natural). There is no such a thing as a strawberry, melon, cacao, peach etc. essential oil. Google it folks. Great recipe though. Thanks! Hi Rosa — chocolate essential oil does exist although it’s not common. Google Cocoa Absolute and you’ll find a few sources to purchase it. It most definitely does exist. Do some research! Approximately how many bath bombs did the recipe make from your mold? From the picture, it looks like 11. I’m trying to calculate for gifts so I know how much material to purchase. Thanks! These are gorgeous, Tanya! They would be thrilling to receive as a gift. I can’t wait to try the recipe. Thank you Bren 🙂 Enjoy sitting in your own bath of hot cocoa…tis the season! Can I replace the clay worry Epsom salt? I have everything but clay on hand. i dont have witch hazel in my country what can i use instead? A TINY amount of water might work. Could Witch Hazel be available under a different name? The Latin name is Hamamelis virginiana. It is a little bit confusing. Could Shea butter be used in place of the cocoa butter? No, because while cocoa butter is solid at room temperature, shea butter is soft. Don’t worry, Cocoa powder doesn’t stain the tub.